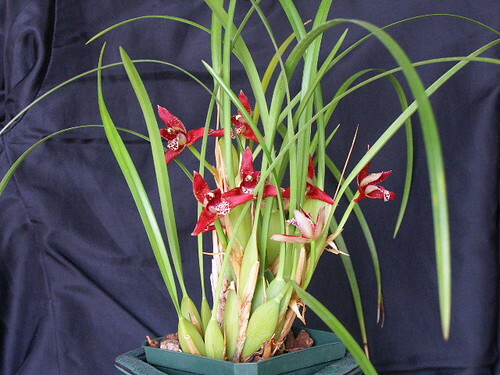 Maxillaria orchids are well-known, but not necessarily popular. There are over 300 species in this genus, but not many are grown by orchid enthusiasts, because only a small portion of the species produces showy flowers. Those that do, produce single flowers on short spikes. Some of them are magnificently fragrant. Native to tropical America, this genus derives its name from the Latin word maxilla which means jawbone. This designation refers to the appearance of many of the flowers of this species. Normally, the lip of these plants looks like an arched tongue and has three unremarkable lobes. The result is a blossom that slightly resembles a jawbone. Don’t let the criticisms of this varied genus, however, prevent you from investigating further. Several species are well worth taking a second look. 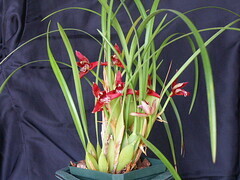 Consider Maxillaria tenuifolia. The blossoms of this plant are small (approximately 1 inch in diameter) usually dark-red and grow on a spike of about 2 inches long. Tucked amongst the leaves, this flower is barely visible, but it still makes its presence known. It emits a scent which can only be described as coconut with a hint of cinnamon. As a result, these orchids are also known as Coconut Orchids. Maxillaria picta is another special plant from this genus. Native to Brazil, produce flowers that range from 1.5 to 2 inches in diameter. These blossoms are usually yellow with the color fading to white at the tips. Dark red marks the edges of the sepals and petals, and the flowers are very fragrant. An epiphyte, this orchid grows fast and often produces several growths during one season. A third Maxillaria orchid of note is Maxillaria schunkeana. Also native to Brazil, this orchid produces small, non-showy flowers. So what’s so important about this species? This orchid’s claim to fame is the color of its blossoms. No one has ever cultivated a black orchid, but with its dark purple-red blooms, this plant often gives the impression of being black. The majority of Maxillaria orchids produce round or oblong pseudobulbs, usually with one or two central-veined apical leaves. In several species, these pseudobulbs cluster on a short rhizome, while in others they keep their distance on an elongated rhizome. Inflorescences sprout from the base of the pseudobulb and produce a single flower. The flower spikes are short (2-3 inches) and never grow longer than the leaves. Because this genus has such diversity among its species growth requirements can vary widely. In general, Maxillaria orchids are epiphytes, which mean they grow well mounted on bark, on branches or in slatted baskets of equal parts fibrous peat and sphagnum. During the growing season, keep temperatures between 60 and 70 degrees Fahrenheit, water abundantly, mist daily and keep out of direct light. Sunlight seems to enhance fragrance production qualities, but the light must be filtered. After growth is finished, lower the temperature by 10 to 12 degrees, and reduce watering, but don’t let the plants completely dry out.